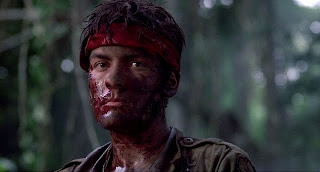 From the violent visuals of external warfare captured by the lens of cinematographer Robert Richardson to the internal battle raging in a young soldier’s heart and mind that Chris Taylor (Charlie Sheen) recounts in letters to his grandmother – manifesting throughout the film in the form of starkly frank and poetically philosophical voice-over narration – Oliver Stone’s intensely personal Platoon is a visceral portrait of the Vietnam War. Oliver Stone finished his tour of duty the same year that John Wayne presented moviegoers with Hollywood’s first Vietnam War picture via 1968’s famously bad right-wing propagandist flag-waver The Green Berets. And with the intention of distinguishing war fact from Hollywood fiction, Stone penned the earliest version of what would eventually become the semiautobiographical first installment of his Oscar winning Vietnam War trilogy in response to Duke’s debacle. Originally written with Jim Morrison in mind, the first draft of the script he called Break matched the film’s action to the music of The Doors and although Stone never heard a word from the musician, the screenplay was with the singer in his last hotel room and sent back to Oliver Stone from Paris after Morrison died. While he would ultimately pay homage to The Doors in a ‘90s biographical film by the same name, it took eighteen long years for time and casting to finally be on Stone’s side to bring his memories of Vietnam to cinematic life. 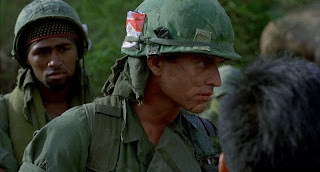 Nearly a decade after the war ended and post-Green Berets ‘70s antiwar epics Coming Home , Apocalypse Now , and The Deer Hunter among others introduced the world to the harsh realities and Post Traumatic Stress Disorder aftermath of the devastating war, Stone rewrote the screenplay again for the final time. And transforming Break into Platoon resulted in the very first major production to have been made by an actual combat veteran from the Vietnam War. 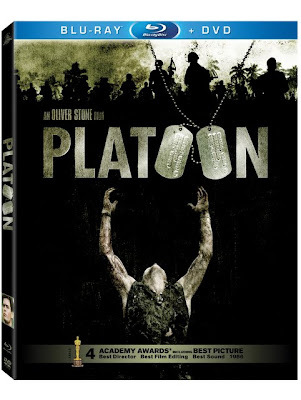 Needless to say, Platoon was well worth the wait as is Fox’s better-late-than-never Blu-ray debut that celebrates the 25th Anniversary of the film’s landmark release, which subsequently made Oliver Stone the first (and only) Vietnam War veteran in history to have won an Academy Award for Best Director. Serving up the picture as part of a money-saving two-disc Combo Pack , MGM/Fox delivers Platoon in both standard (DVD) and Blu-ray high definition with multiple Flashback to Platoon making-of-featurettes, war and film related documentaries, vignettes, audio commentary (sadly none featuring the superlative ensemble cast), as well as deleted and extended footage. From the enhanced 3D-like depth perception of foliage in the jungle to the staggered gunfire that shoots out of all five speakers and rumbles through your subwoofer, Platoon transports you to Vietnam from the safety of your sofa for its unrelenting 120 minute running time. Steeped in authenticity and unflinchingly graphic even to this day, although Platoon was banned in Vietnam for the film’s depiction of the citizens, Stone’s controversial characterization of American soldiers is anything but black and white as we’re quick to learn that aside from tsunamis of red blood and the jungles of green, war’s official color is gray. 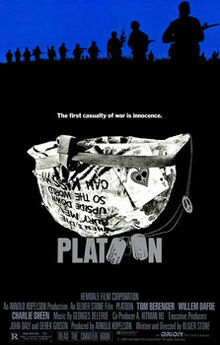 Moreover, the reason that Platoon remains such a successful subtextual document of antiwar is because it hides its message in “Action Movie” plain sight – never taking sides on any level other than that of basic morality which in itself is a Catch 22 since there’s nothing more amoral than the taking of a human life and that’s the name of the game in war. Yet as every frame of Platoon reminds us – epitomized by Claire Simpson’s masterful puzzle precise editing – Stone is never content to focus on the external battle without reminding us of the internal one as well. To this end, Platoon foreshadows some of the humanistic topics, driving themes, existential motifs and unmistakable character types that were either destined to resurface or Stone would set out to revisit again and again throughout his career. From his obsession with the male-centric struggle for power represented by a “good angel” or a “bad angel” – usually in the form of two dueling father figures – that defined the plot as well as the main character played by Charlie Sheen in Platoon and Wall Street, the byproducts and questions that go along with standing up for what’s right regardless of what it will cost abound in Stone's oeuvre. Of course, movie villains are traditionally far more memorable than their heroic counterparts and in the world of Oliver Stone, this is perhaps best represented by the fact that all the director needed for a Wall Street sequel was his deliciously diabolical “bad angel” Gordon Gekko (Michael Douglas). 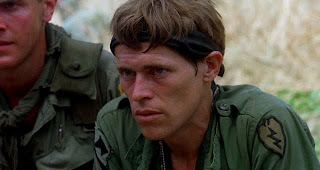 Yet thanks to Stone’s bold decision to cast Willem Dafoe against-type as Chris’s surrogate father figure, the Christ-like soldier Sergeant Elias – two years before Dafoe would play the son of God in Martin Scorsese’s Last Temptation of Christ – Platoon marks the one time in Stone’s filmography where the “good angel” remains forever ingrained in the audience’s heart and mind.